Grande Vegas Casino is a sister to Jackpot Capital casino reviewed here and provides you with either a download or instant play version of the casino which is compatible with Mac or PC, you can also play in either fun or real mode. It is powered by Real Time Gaming (RTG) and US players are welcome. Besides the many games that you can play, including video slots, specialty games, table games, video poker, progressives, there are also slot tournaments available. 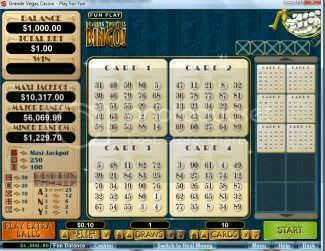 One of the newly introduced games is Roaring Twenties Bingo, an online bingo which I really like playing, it is great to if you want to walk away from the computer for awhile as you can play up to 100 games automatically. You can wager from 1 cent to $5 per card and you can choose from 1-100 cards to play. You can also play with 5 extra balls by choosing that option. At the end of the draw, 5 extra balls will be drawn, if you choose to play this feature, your total bet will be doubled. The currency used at Grande Vegas is US Dollars ($) and the deposit options available are the standard set of e-wallet options including NeTeller, Click2Pay, UseMyWallet, Wire Transfer, Direct Money, paysafecard, instadebit, Money Bookers. Transfer money, Eco Card and credit cards. In order to process your withdrawal the following faxback authorization form is to be filled out. There is a great welcome offer of 100% match up to $100 for new players and for existing players there a number of promotions including the Grande Rewards, Cosmopolitan, Grande Midmonth and Grande Monday just to name a few. So try out Grande Vegas Casino for yourself and take advantage of one of their many promotions available to you. I used to deposit at this casino. I never had any real trouble there, but Live Chat didnt seem all that friendly to me, and free chips are scarce. I just got a snail mail $10 private code from them. If you do download make sure it's Grande Vegas with an E, because there's another one without the E that's not an RTG casino. Or just use the link here! :hmmr I couldn't find it! This is such a great Casino! They are very generous with their offers too! I agree Judy they usually send stuff via snail mail in a plain white envelope so never just toss those out!! Grande Vegas Casino seems an awesome casino where people can play each type of casino games be getting attractive bonus offers and effective promotions. I will visit this casino very soon for having lots of fun and enjoyment. You will enjoy it Ryan! They are a very trusted RTG casino and send out some really cool bonus offers quite often. Yeap they are always sending out snailmail and stuff! Because Grand Vegas Casino is a sister company of Jackpot Capital I could not even avail the welcome bonus they offer. But this does not stop me playing here. Just like Jackpot Capital this casino is awesome lots of game to play and I already have some decent wins.